If you want a self healing injector port on your bag please click here first. 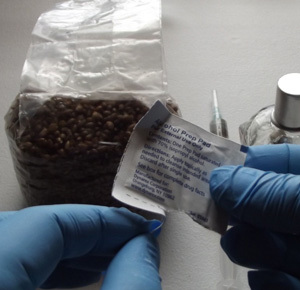 This is the correct procedure for inoculation of our sterilized rye grain spawn and BRF bags. 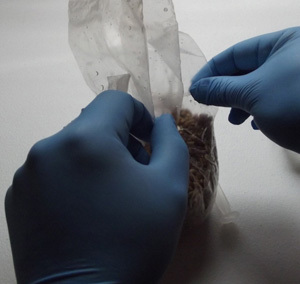 Once you are ready to inoculate our rye bags with your gourmet edible mushroom spores you need to do a check of supplies you will need. 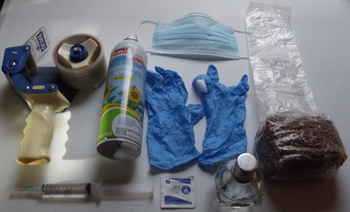 Once you have gathered up all of your supplies you can begin. Make sure the room you are working in has very still air. No heat or air conditioner blowing air around. Start by cleaning your work area. Wipe down the table and so forth. After you have your work area prepared, spray the air in the room you are working in with the disinfectant spray. Don't be afraid to use a liberal amount. Make sure your hands are clean and put on the rubber gloves and mask. Look for the small piece of white tape on the bag just above the grains. This will be your inoculation point. 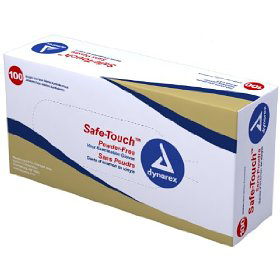 Gently clean the inoculation point with your alcohol pad. Now you need to gently inflate the bag so you do not poke the needle through the back side of the spawn bag. You can achieve this by gently pulling the gussets on the bag apart. This will draw some air into the bag through the filter patch. You must flame sterilize your needle before inoculation. 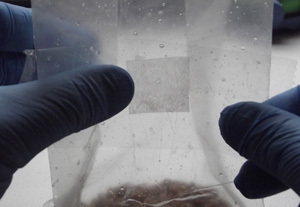 You must do this every time you inoculate an individual bag. 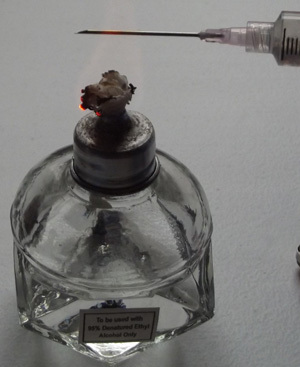 We used an alcohol lamp for this demonstration, but you can also use another source of flame. If you use a candle or lighter there will be some black residue on the needle. Simply wipe it with your alcohol pad. Let the needle cool briefly or cool it with your alcohol pad. Now it is time to inoculate the bag. Gently push the needle through the inoculation point on the bag. Gently depress the plunger on the syringe. Use 2-4 cc of spore solution per one pound bag. If you are using a liquid culture you can use up to 6 cc per one pound bag. 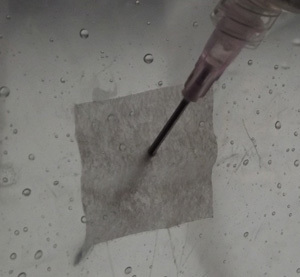 Now you must swiftly cover the inoculation hole with your tape as you withdraw your needle. There you have it. 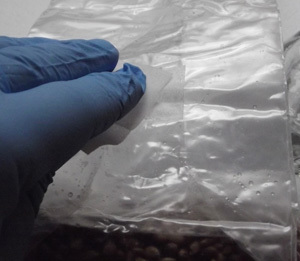 The correct procedure for inoculating Out-Grow's sterilized grain bags.